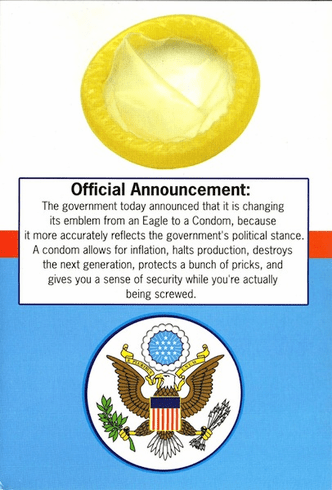 Official Announcement: The government today announced that it is changing it's emblem from an Eagle to Condom, because its more accurately reflects the governments political stance. A condom allows inflation, halts production, destroys the next generation, protects a bunch of pricks, and gives you a sense of security while you're actually screwed. .... Happy Birthday. Did you want that gift wrapped?